Just wanted to let you know that this berry-licious post is sponsored by my friends over at California Strawberries! The gang’s all here, and we got our strawberries! Guess what, we’re not talking about food today! Okay, well we sort of are. We are talking all about STRAWBERRIES! 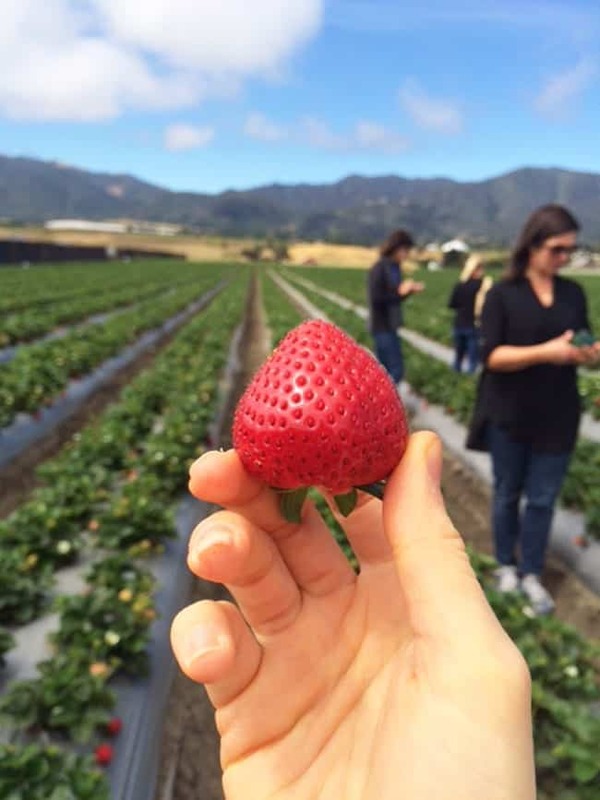 A few weeks ago I had the awesome experience of going to Monterey, California with the California Strawberries Commission to learn about ALL things strawberry. We also ate A LOT of strawberries. Not that I am complaining. 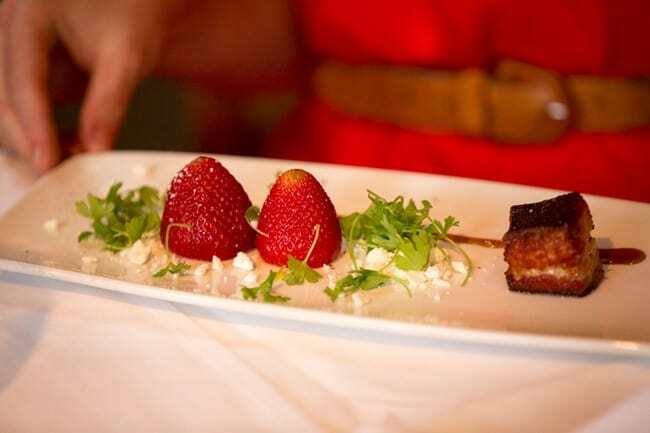 Pork belly with balsamic strawberries and feta cheese. Yep, still dreaming about this one. 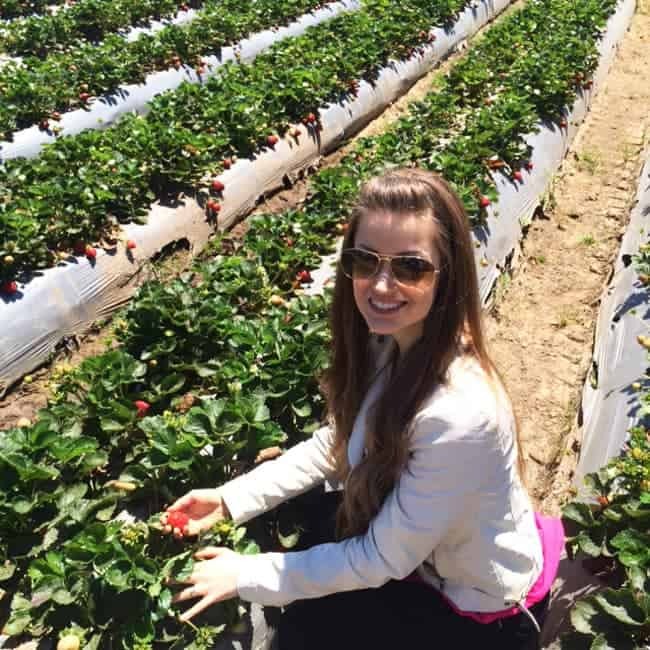 Monterey is SUCH a beautiful area and I absolutely loved meeting all the of the awesome people behind California strawberries, the farmers and even some new blogging friends! Also, you SRSLY have not lived until you’ve had a fresh California strawberry right. off. the. vine. Really. I wish I could learn to teleport just so that I can randomly hit up the fields of California and pick some strawberries to munch whenever I felt the urge. Which would be, like, ALL THE TIME. They were SO SO SO good you guys. Like I said, we ate some amazing things: pork belly with balsamic strawberries, elderflower cocktails with POP ROCKS (how fun is that?! ), the creamiest strawberry ice cream EVER, bacon dusted, cheese-coated strawberries and strawberry shrimp ceviche stuffed avocados….you know, just to name A FEW. Some of the CREAMIEST ice cream I have ever had. Finished with a delicious butter cookie crumble! 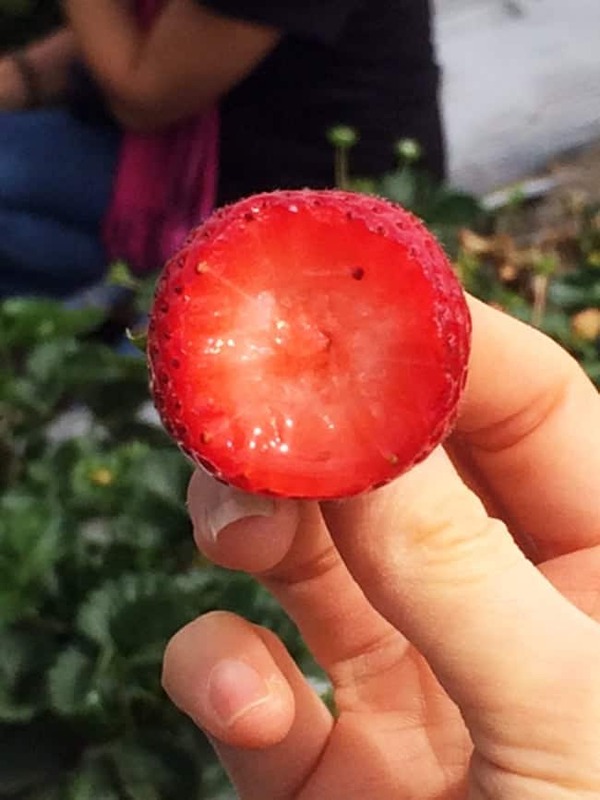 BUT, besides eating ALL THE STRAWBERRY THINGS, we also learned a lot of really exciting nutrition-facts about strawberries and also some information about pesticides. On the trip we learned about the Alliance for Food and Farming. They created these super nifty website “safefruitsandveggies.com” that is a website developed with experts in toxicology, nutrition, medicine, and risk-analysis. The farming information on the site is science based, peer-reviews and SUPER easy to understand. 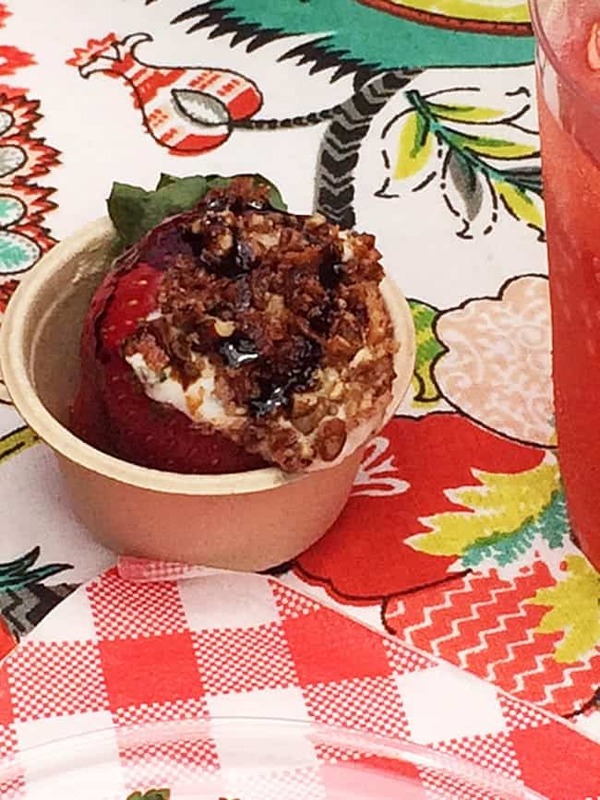 We are fresh farm cheese stuffed strawberries with balsamic vinegar, pecans and BACON DUST. Bacon dust friends. It’s life changing. I love that the main goal of the Alliance for Food and Farming is to provide easy to understand, science-based information so that facts, not fears, guide shopping choices. They just want to help people lead a longer, healthier life by eating more fruits and veggies. They want YOU to know that organic or convential produce can be eaten with confidence and both are safe. The key point is just to start eating them! Super simple! The coolest feature (I think!) of the website is the pesticide residue calculator. This tells you many servings of a fruit or veggie you could eat PER DAY without any effect even if the fruits/veggies have the highest pesticide residue recorded by the USDA. 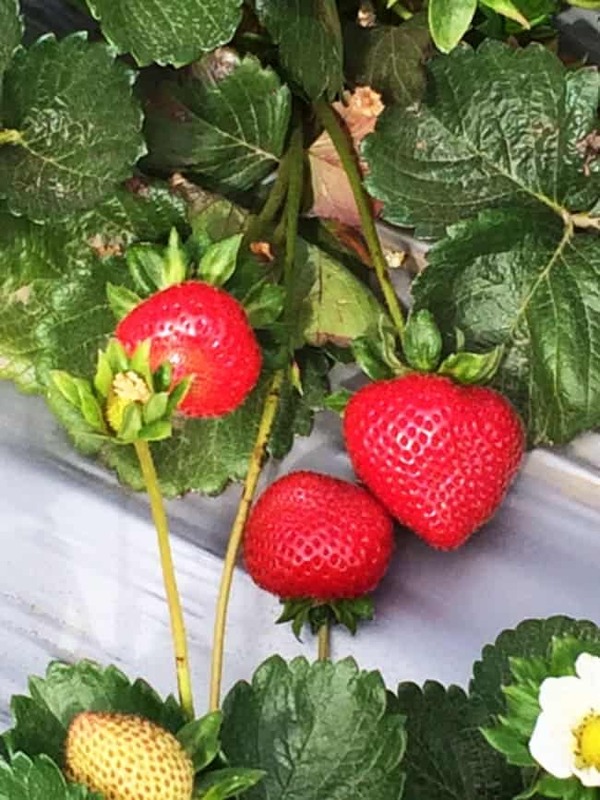 For example, did you know that pesticide residues on strawberries, if found at all, are so low that childen can consume 1508 servings PER DAY without any effect. You guys. 1508 servings of strawberries PER DAY. 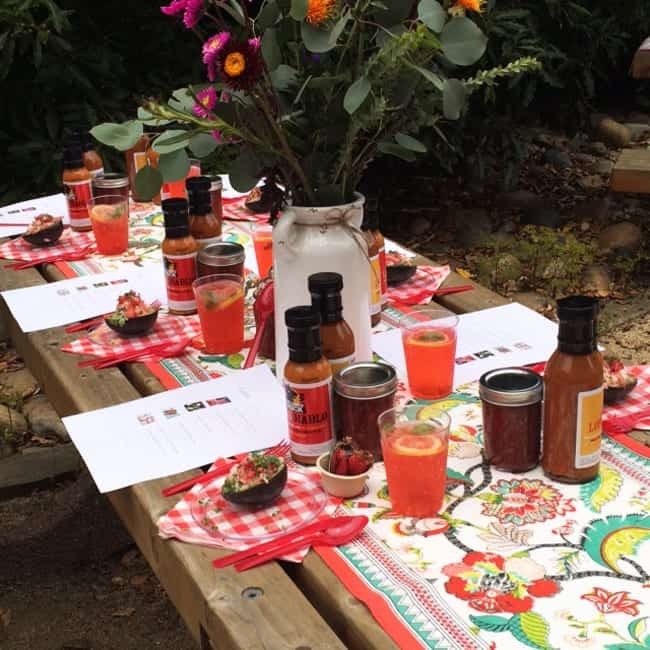 So, how adorable is this set up that we had for lunch on our last day?! No harm done. SO interesting! We also learned some health facts about strawberries, and I’ve picked my top 5 to share with you! #1: Strawberries are brimming with good-for-you nutrients! Pretty much the worlds most perfect strawberry. #2: Strawberries are good for your heart! Anthocyanins are phytonutrients (or natural plant chemicals) found in strawberries. A 2013 study found that high anthocyanin intake (more than 3 weekly servings of strawberries) is associated with a lower risk of heart attacks in middle-aged women. Excuse me while I go feast on strawberries. #3: Strawberries are good for your MIND! Researchers recently discovered that an eating plan that can lower your risk of Alzheimer’s disease by more than one-third: The MIND, diet. (The Mediterranean-DASH Intervention for Neurodegenerative Delay) You know what it’s secret is? Berries! A healthy daily dose of strawberries and blueberries in your diet can play a big role in preventing dementia as you get older!! Workin’ on my pickin’ skillz yo’. #4: Strawberries have less sugar than many realize! Myth: Strawberries have more sugar than other fruits. Fact: Strawberries have the lowest amount of sugar (7 grams) per one-cup serving compared to these other popular fruits. They taste like natures candy…but they’re a whole lot better for ya! SRSLY. How juicy and amazing does this look? Side note: IT WAS. #5: Strawberries have more vitamin C than an orange! Myth: Oranges have more vitamin C per serving than strawberries. Fact: A one-cup serving of strawberries has more vitamin C than an orange. Vitamin C is known for its antioxidant properties, helping to protect the body from oxidative stress. This one SHOCKED me. I thought that oranges were the be all and end all of the Vitamin C world! Nature’s candy right there folks! Well, I hope you learned some fun strawberry facts! Now go and get your eatin’ on! THIS POST IS SPONSORED BY MY FRIENDS AT CALIFORNIA STRAWBERRIES. THANK YOU FOR ALLOWING ME TO CONTINUE CREATING GREAT CONTENT FOR YOU BY SUPPORTING PARTNERSHIPS WITH SUPER-FAB BRANDS THAT FOOD FAITH FITNESS LOVES TO WORK WITH! AS ALWAYS, OPINIONS REMAIN 100% MY OWN! I love strawberries! This looks like such a fun experience! It really was! Thanks Marye!! What a fun, delicious and informative trip! I’ve always wanted to go to a strawberry farm…I’d probably eat so many of the strawberries off the vine I’d make myself sick. 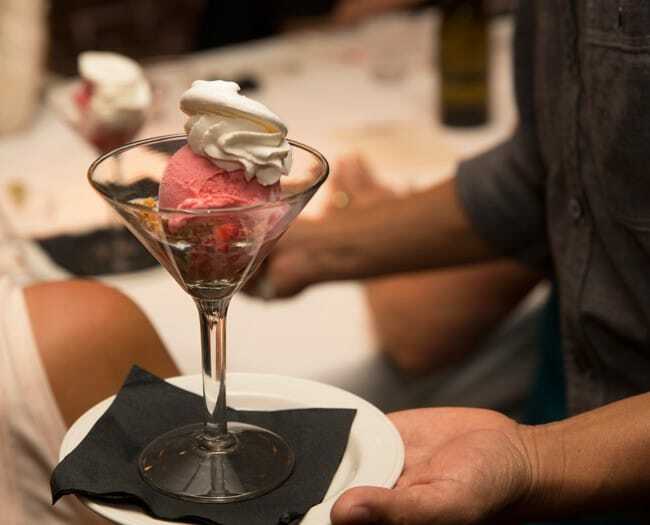 That strawberry ice cream looks to die for! Haha I did eat so many strawberries but it was so worth it! Thanks! yeahh what a super fun time!! I love Cali and strawberries! Looks like you had a fabulous time Taylor! I love Monterey! I sure did – and it was beautiful! Thanks Cynthia! Wow Taylor – what a fantastic experience for ya! Brought back memories of when my daughter was younger and we went strawberry picking every spring and she’d be red from head to toe by trying to eat all the strawberries! Haha yes! I ate SO many of them! Thanks Shashi – it was so fun! That is such a neat adventure!! I had no idea their website had the pesticide feature, am going to check that out! How neat! You will love it! Thanks girl! So much fun!! Strawberries are one of my fave fruits – second only to cherries! Cherries are good too!! Thanks Paige! Definitely #3 was the most shocking fact–who knew that strawberries have components that can fight Alzheimer’s?! This now makes me really want to eat more strawberries! RIGHT?! I’ll be eating them ALL day now!! Looks like you had an ahhmazing time Taylor! Loved getting a look at all those gorgeous strawberry creations you were able to enjoy! Thank you – I did! Nice! I love strawberries and miss strawberry picking from my childhood. Looks like such a fun trip! This looks like such a fun trip with a group of awesome people! Got to love California Strawberries! Thank you Emily, it was so fun! Looks like such a fun time. And those strawberries…. They were so good! Thanks Wendy! Love picking my own strawberries. I missed out this year in Pennsylvania. The season just went too fast. I am always jealous of all my dietitian friends who have been invited out to California. Maybe someday I will get to go!